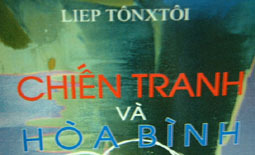 Foreign names in Vietnam may be found in two forms: A Vietnamese-style spelling that conforms with Vietnamese pronunciation, or the spelling in the original language. (In the case of Russian, this means a European or English-style romanisation of the original Cyrillic letters). This is a small selection of photos, mainly taken in a Saigon bookshop, showing the variation that is found. 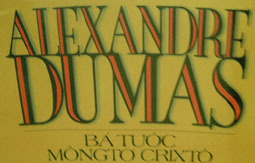 French authors are prone to be put in Vietnamese style, especially well-established literary figures. But there are not a few cases where the 'Vietnamised' versions and the original versions can be found side-by-side on the bookshelves. If the author is less well-known, he may be found in the original spelling. This volume by Henri Charrière, using the original French spelling for the author's name, was published by the same people who consistently put Zola, Hugo, and Stendhal in Vietnamese style. 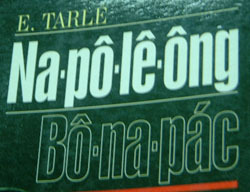 'Napoleon Bonaparte' (Vietnamese style spelling), written by E. Tarle (original spelling). Classic Russian authors are frequently found in Vietnamese spellings. Below are two different Tolstoy's and Turgenev. Notice the variation in word division (hyphenated and single word). The first example (top-left) cunningly reverses the 'N' to give a Russian feel to the script. Modern authors writing in English almost overwhelmingly use the original spelling (even in the case of not-so-modern authors like Galsworthy, Maugham, and Christie).